Who among us didn’t have a dragon phase (or are still in it)? Exactly. This movie takes this childhood fascination and transforms it into something wonderful, magical—in 3D, no less. (It’s too bad I only watched it on my laptop.) Whereas everything around us today feels like it’s all about marketing to the largest possible audience, it is a rare, honest, feel-good film: it doesn’t try to be anything else, and it works that way. Let me summarize. Hiccup is an awkward boy. The son of the chief Viking in his village, he has striven all his life to prove himself worthy of his race and his father. On an island in constant war with dragons, every kid dreams of becoming a great dragon slayer, and Hiccup is no exception. The problem is, when he finally gets his chance, he finds himself incapable of hurting a dragon and instead befriends it, realizing that there is so much more to the creatures than he had been taught to assume. 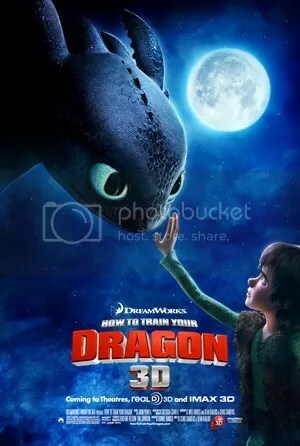 This entry was posted in Adventure, Animated, Fantasy, Film and tagged Chris Sanders, Dean DeBlois, How to Train Your Dragon on January 3, 2011 by Michelle.